Following a recent post in which I compared Mother Nature to Scarlett O’Hara, Janet of Planticru Notes commented on my ability to weave films into a gardening blog. That small sentence was enough of a seed to get me thinking about gardening movies that I enjoy, especially now that Mother Nature has given the northeast a cold shoulder. Movies, like gardening, have always provided an escape for me. No matter the emotion of the moment, each activity gives me a chance to think and breathe and laugh and cry and absorb. Sometimes I need a Zinnia, sometimes I need a period piece, like Dangerous Liaisons. Certain films, like certain plants, are part of my very being. The garden will always have Dahlias, and moments in life will trigger a scene from What’s Up, Doc, which I will then recite in my head. At the same time, while each of these passions can be solitary in nature, they can also be quite communal. Put a group of moviegoers in a room and a group of gardeners in another room – and there are endless conversations and accolades and critiques and comparisons. Watching in the dark and growing in the sun — both bring us together. Here, in no particular order, are some garden-related films. Grab a pillow, a blanket, and a bowl of popcorn — our show is about to begin. 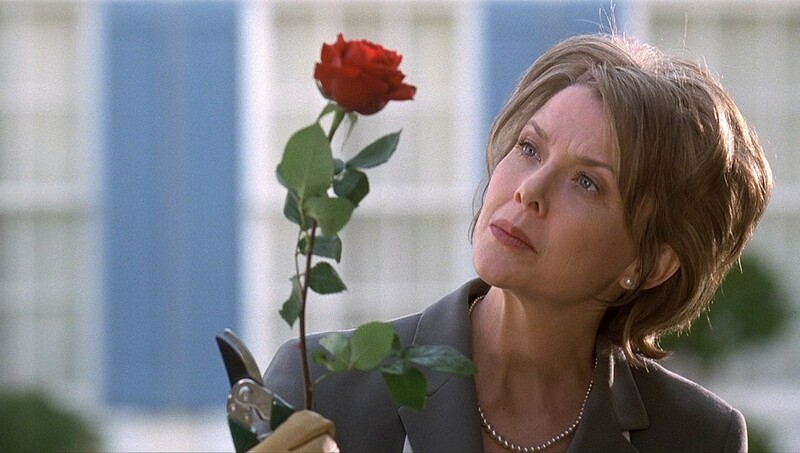 American Beauty — A modern classic and Oscar winner in its own right, but I personally love Annette Bening and her maniacal love for her roses — I think because I have limited success with roses. Besides, the Hollywood variety are always perfect and black spot-free. Greenfingers — This British import is usually at the top of every favorite gardening film list, and for good reason. Based on a true story, the comedy follows the work of a group of prisoners who are introduced to gardening. Their efforts are eventually presented to celebrated gardener Georgina Woodhouse, who becomes so entranced with the cons’ gardening skills that she sponsors them in the prestigious Hampton Court Flower Show. Very funny. Very Brit. Very Helen Mirren, who stars as Ms. Woodhouse. The Wizard of Oz — I know. Technically, this is not a gardening movie — although the opening does take place on a Kansas farm. 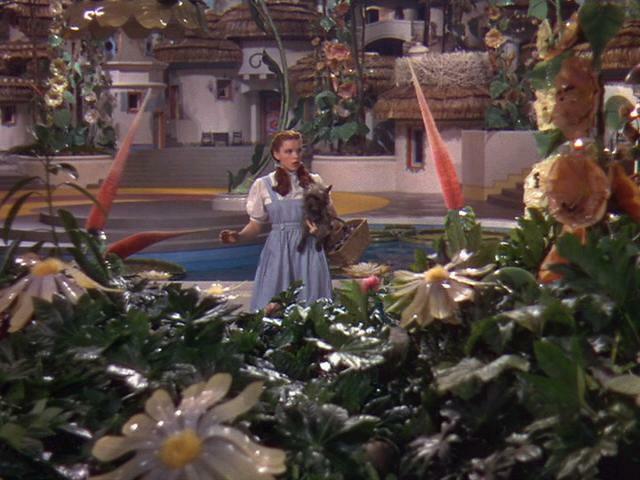 Nevertheless, you can’t help but catch your breath when Dorothy and Toto step out of the front door of the farmhouse and into Munchkinland — lots of color, glossy foliage, and a path of yellow brick pavers to follow. As gardeners, I think we experience that each time we open our own garden gates or catch a glimpse of a surprise planting. So what if there’s a wicked witch in the way — just grab the garden hose and begin watering. Prisoner of Second Avenue — Also not a garden movie, but this little-known Neil Simon flick is as relevant today as it was when it was released in the economically wilted ’70s. It follows the stars, Jack Lemmon and Anne Bancroft, as they survive unemployment in New York City. In one scene, they drive to the country to visit with Jack Lemmon’s brother and sister-in-law. There, our couple is treated to the joys and perils of life outside of the concrete jungle, including a run-in with poison ivy and organic gardening. This scene alone is worth the price of admission. 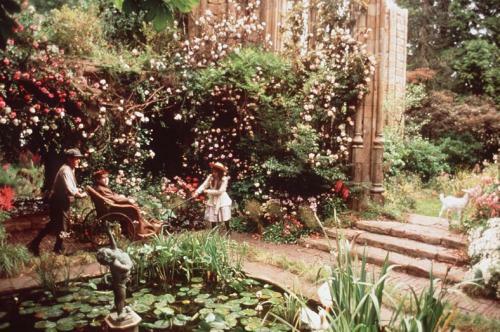 The Secret Garden — This is an absolutely magical film about a girl, a boy, and the healing wonder of reclaiming a forgotten English garden. I love the idea of uncovering something from the past, and if it happens to be a walled garden in the English countryside — well, that’s not too shabby. The Garden — This compelling documentary highlights the passion of gardening, the determination of a community, and the battle between a healing neighborhood and a developing city. If you are passionate about gardening, urban renewal, community gardens, or people, find time to watch this important and moving and enlightening film. The Kids Are All Right – Annette Bening is also in this film, but it’s Julianne Moore who is the gardener. This film is an interesting and sometime humorous take on the changing dynamic of the American family and all of its complexities and strengths. 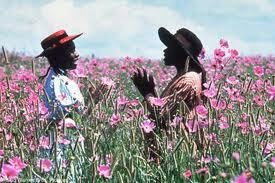 The Color Purple – I have a long, emotional history with this film. Simply put, I cry from beginning to end. In fact, no matter where I catch it while channel surfing, I become a weeping mess within seconds. (Just writing this is making me misty!) But there is a line in the movie that has stayed with me through all of my tears: “I think it pisses God off when you walk by the color purple in a field and don’t notice it.” Amen to that! I always look for the gardens in films, too. While other people are watching the leading man, or the leading lady, or the fight, or the kissing, or the …anything, I’m scanning the background trying to figure out if I could grow that certain plant, how fake the roses are, if I could use that landscape idea, etc. And now I have a couple more movies to see that I haven’t seen before! Thanks! I’m sure there are plenty of us garden gazers out there. Happy viewing! You put together a fine list, Kevin, making a colorful tour through the garden of films. Cheers. Thanks. They should be enough to warm up these cold and blustery winter nights. Oh man. These are priceless. Love The Wizard of Oz! It has both “paa-peeese ” and flying monkeys! Your movies reminded me of another great gardening movie, Saving Grace…about British ladies growing the world’s favorite herb. No, not rosemary. Great post! Jim, glad you enjoyed it. I’ve never seen “Saving Grace,” but I’ll have to check it out. See you at the movies! I recently posted @ http://bit.ly/xIzncp about the Hitchcock classic,”Rear Window”, because one of the Larix kaempferi (Japanese Larches), which I grow in my urban (NYC) terrace garden has been getting his television program/movie “fix” by watching them through the rear windows of the building across the courtyard from my garden since I don’t own a television. You and your plants have excellent taste in movies. “Rear Window” is an absolute fave, but I will have to check out “Kiwi Speaks.” I’ll all head over to your site for some reading . . . Cheers! What a great memory about “The Secret Garden.” I just recently read the book, and I was completely enchanted. Now, if it were only made of chocolate. . . I loved the references to Scarlett in that post! I think GWTW is the last movie I have seen!? I don’t like to watch movies, really…. I guess I resent being emotionally manipulated like that! It could work — but I would have created a potager garden instead. That would be a field of dreams. i wrote down some title and can’t wait to try them. I hope you enjoy them. They’re a great cure for the winter blues! I’m sure I’ll wake up in the night and think ‘oh I didn’t mention that one!’ but right now the only movie coming to mind is Green Card. Marrying a strange foreign man to gain a garden – the ultimate sacrifice. The scene where Gerard Depardieu plays the piano and recites the poem about the trees in french breaks my heart just a little. I remember seeing that long ago, but I can’t remember a thing a out it. I’ll have to revisit this one. Thanks for letting me know. 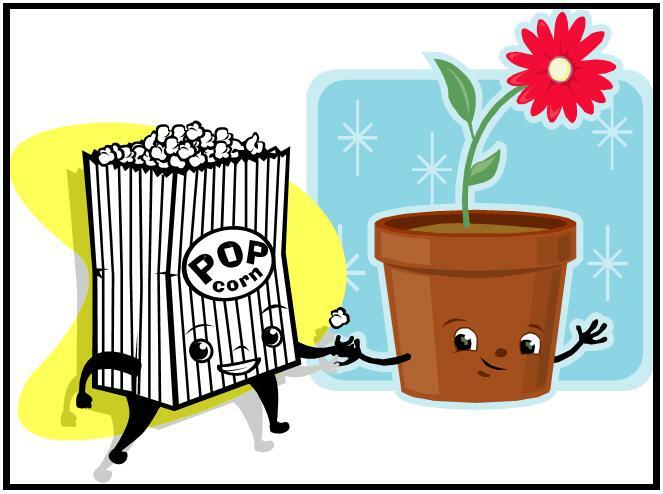 I love movies as well, garden-related or otherwise. It is nice to experience other worlds and situations. Add Enchanted April… a lovely film that always inspires me and leaves me smiling. I’ve never heard of this, but I love the name. It rings of spring! I will keep an eye open for it. Thanks! Thanks…again I loved your blog! American Beauty…yes! all those roses, and the poster for that film fabuolous! Secret Garden…Lovely , touching, film…oh and the Walled Garden ”Hortus Conclusus’, …symbol of the inner self and healing, regeneration. HAve you seen “the Gleaners? its a doco…great too…. Nice to hear from you. I’ve never heard of “The Gleaners.” I’m on a mission to learn more about it — thanks for the recommendation. Enjoyed scrolling through the film names and remembering how much I enjoyed many of them. I think Barbra Streisand ought to get honorable mention for On A Clear Day You Can See Forever. Sometimes I wish I could “encourage” my garden to grow the way her rooftop oasis did. Consider it added to the list. By the way, Ms. Streisand was also is in What’s Up Doc? If you haven’t seen this screwball comedy, I HIGHLY recommend it. Not much in gardening, although there is a great car chase down Lombard Street and a young Madeline Kahn. Enjoy! I saw What’s Up Doc? when I was pregnant with my son. He turned 40 last year. My kids told me a few years ago that whenever they came to visit, it was dollars-to-donuts I’d be watching What’s Up Doc? on the VCR & later the DVD player. I never laughed so hard in my whole life and still laugh to this day at that courtroom scene after they all drove into SF Bay. John Hillerman was great as the hotel manager. The bicycle inside the Chinese dragon was classic. Thanks for the link! Looking forward to reading your awards. Check out “Saving Grace,” for those with a sense of humor. But all about growing, literally and metaphorically.